Naval Support Activity Naples (NSA Naples), home to US Naval Forces Europe and the US Sixth Fleet, is located at Naples Airport in Naples, Italy. The base is part of NATO Allied Command Europe and has a mission to exercise area coordination over NATO commands in the Naples and Gaeta region. 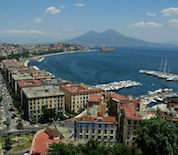 Naples is a beautiful seaside city in Southern Italy and is therefore a popular tourist destination. Nearby attractions include Caserta Royal Palace, Herculaneum, Pompeii, Mount Vesuvius, Island of Capri, and the Amalfi Coast. This NSA Naples directory features the critical info you’ll need to navigate through the many facilities and recreational opportunities available on base.